In 2014, amount owning to director is 1,042,550 compared with 2,150,151 in 2013. 冷眼 holding 0.22% or 502k of shares on year 2015. Revenue is increasing year by year but the net profit drop a 24% on year 2014 from 2013. This is due to the loss of disposal of Polyethylene (PE) Modular machine. Account based earning valuation model giving the intrinsic value of 0.45 which is MOS 24% of current price. 第一天's analysis giving 0.657 as intrinsic value and MOS is 48% of current price. Total borrowing per share is higher than cash per share by 0.01. Insufficient cash company. The entire Graham’s valuation is overvalued to the current price. EPS's CAGR is attractive because 28% from 2010 to 2014. In addition, the price has a CAGR of 48% from 2010 to 2014. Capital gain of 投机 in short term maybe suitable. From the both EPS and price's CAGR, the PE on 2015 is focasted at 17.87. 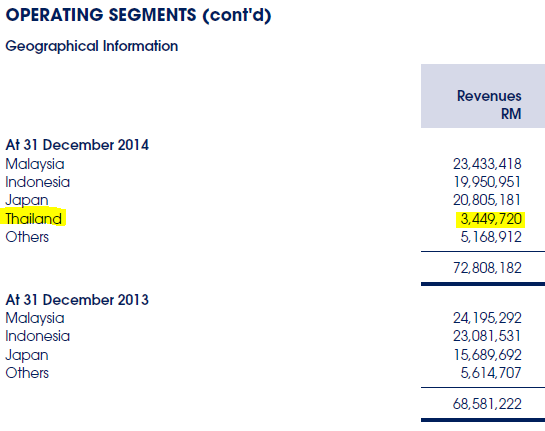 Overvalued from the averaged KLCI PE coz price's CAGR higher than EPS's CAGR. P/B, PE and DY not match my criteria on stock. Tan Siew Chin and Chen Lee Chew both husband and wife is the CEO and Non-Independent Non-Executive Director respectively in company. Net loss on disposal of property, plant and equipment accounted to RM1, 685,044. 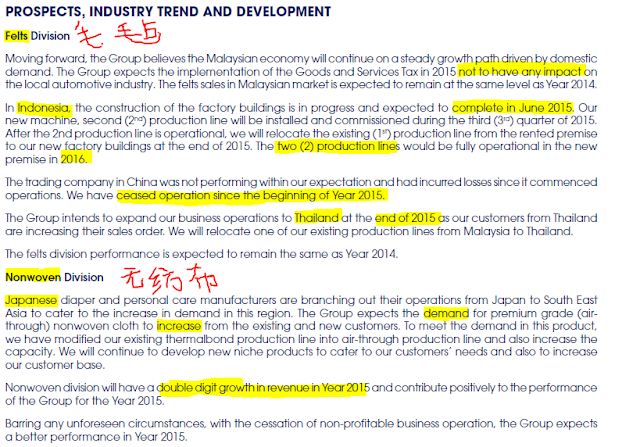 Administrative expenses increased 22% or RM870k to make the operating profit going down. COGS increased 9% while revenue increase 6% from 2013 to 2014. There is using of cash in investing of purchasing the property, plant and equipment accounted to RM8.3 million. This amount is buying the land and building. This makes negative cash in 2014 with amount RM 2,407,238. Future growth of the company is optimistic. Suggested to buy if EPS in future is giving favorable result. Look forward to the result Q1''2015.